The noble fir can take eight to 12 years to reach holiday height, which means that that spurt of over-planting two decades ago led to oversupply about 10 years ago. This flooding of the market coincided with the Great Recession, when many people were scaling back their Christmas spending. Another 10 years on, the effects of that under-planting are now being felt around the country, in the form of shortages and higher prices. True for all of those in his line of work, the weeks leading up to Thanksgiving were Casey Grogan’s busiest time of year. Earlier in November, he harvested 70,000 Noble and Nordmann firs at Silver Bells Tree Farm, his Christmas-tree farm in the foothills of Oregon’s Cascade Mountain Range. As the holiday neared, he watched his crop cruise off in the backs of around 100 semi-trucks, following the path of most of the Pacific Northwest’s holiday crop, 92 percent of which is shipped to outside the region. Nearly half of that lands in California, and most of the rest ends up elsewhere in the West, in Gulf states, or in Mexico. This was a smaller season than Silver Bells has known in the past: The farm, which once shipped about 100,000 trees annually, downsized from 700 to 400 acres of Christmas trees in recent years. The reduction is part of a trend that has played out across the Pacific Northwest—the country’s leading Christmas tree–growing region, with Oregon the highest-producing state and Washington the fifth—and is the long-realized product of overzealous planting 20 years ago. That was a period, Grogan explains, when prices were favorable, land and labor were affordable, and trendy new crops like hazelnuts, wine grapes, and blueberries hadn’t yet lured some farmers away from more traditional choices such as Christmas trees and grass seed. “I don’t think [farmers] realized how many trees were being planted compared to what demand was,” says Grogan, who sits on the board of the Pacific Northwest Christmas Tree Association (PNWCTA), a regional trade group. The Northwest’s most popular variety, the noble fir, can take eight to 12 years to reach holiday height, which means that that spurt of over-planting two decades ago led to oversupply about 10 years ago. It was especially poor timing because this flooding of the market coincided with the Great Recession, when many people were scaling back their Christmas spending. “Prices fell off the roof and growers were losing money, so they didn’t have the incentive—and in some cases they didn’t have the equity—to invest in planting seedlings,” says Tim O’Connor, the executive director of the National Christmas Tree Association (NCTA), a Colorado-based industry organization. Another 10 years on, the effects of that under-planting are now being felt around the country, in the form of shortages and higher prices. 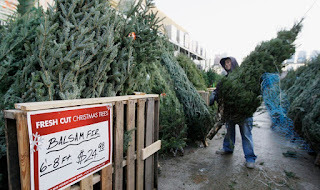 Grogan says that shoppers in the regions supplied by the Northwest can expect to pay 10 percent more for a tree this year and that those who wait to pick out a tree may not have many to choose from. Supply is also diminishing, although not to the same degree, in North Carolina and Michigan, which have the nation’s second and third largest Christmas-tree outputs. “It is something the whole industry is feeling, but it is more expressed in the Northwest,” O’Connor says. The NCTA estimates that 27.4 million trees were purchased in the U.S. last year. This year’s shortage represents a not insignificant chunk of that: Exports from the Pacific Northwest will be down about 1.5 million trees this year, according to Ken Cook, whose McKenzie Farms has 8 million trees planted across nearly 10,000 acres in Oregon. “There’s a huge shortage of Christmas trees, and it’ll continue to be that way for at least 10 years,” says the 80-year-old farmer. Eighty-five percent of Cook’s trees are claimed by big-box accounts, including Lowe’s, Home Depot, Walmart, Costco, and Orchard Supply Hardware. These large retailers work contracts out several years in advance, and so won’t be as impacted by this year’s squeeze as local garden centers, nurseries, nonprofit lots, and other small businesses. “With the shortage of trees, the small independent retailer is the one who is not finding trees in the market this year,” says Cook. This has been the case for The Farm at El Mirlo, a two-acre family farm in northern San Diego County that grows seasonal vegetables, gourds, and loofahs, and transforms into a Christmas-tree lot during the holiday season. Patricia Vittoria, who runs the business, says it relies on year-end tree sales to fund the following year of farming. The shortage first became an issue for her farm last year, when it had trouble sourcing enough of its bestseller, the noble fir. “That’s because the majority were already committed to the big-box stores,” says Vittoria. Between having a smaller stock on offer and a decision to not raise prices, the farm saw its Christmas-tree income drop 50 percent in 2016. This year, unable to obtain trees from their usual Oregon supplier, Vittoria’s husband visited more than a dozen farms and wound up purchasing from four boutique-sized Oregon growers. Vittoria says she was left with no choice but to raise prices this year; they’re 15 percent higher than they were in 2016. The market for Christmas trees has followed a certain rhythm: A shortage today drives prices up, which induces growers to plant more, the effects of which will be felt in the time it takes for a noble fir to mature. Last time that happened, the market became oversaturated. “I’m sure all growers would agree that that experience is not something we would like to repeat,” Grogan says. He thinks farmers will be more restrained this time around.